In honor of the anniversary of Guru Ram Das' birth, join us to chant Dhan Dhan Ram Das Guru for 2 1/2 hours. Yogi Bhajan called this the mantra for miracles and said that chanting Dhan Dhan Ram Das Guru can bring miracles into your life and make the impossible possible. The fourth of the ten Sikh Gurus, Guru Ram Das is considered to be the patron saint of Kundalini Yogis. Yogi Bhajan called him the Lord of Miracles and meditating on his name can bring deep healing and a connection with the divine. Meditating on Dhan Dhan Ram Das Guru can also bring bounty, beauty and bliss. There is a science to the sound, so it is not necessary to be a Sikh - or even to know what the words mean - to benefit from this meditation. You benefit from the physical act of chanting. Through the generation of sound, you create a vibration which stimulates the pituitary gland. Movement of the tongue stimulates 84 meridian points in the mouth which also impacts the pituitary gland. The entire glandular system is affected allowing you to strengthen the immune system, increase energy, calm the mind, heighten intelligence and intuition, and experience a state of bliss. 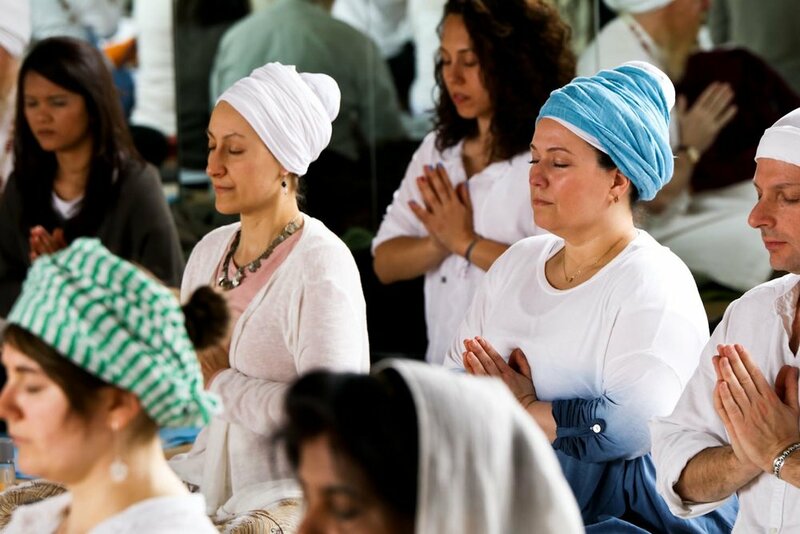 Everyone is welcome to join this mantra marathon, regardless of prior experience with Kundalini Yoga or with long meditations. If you feel uncertain about or a little intimidated by the thought of meditating for such a long period of time, you might find helpful our recent article about rising to the challenge of a 2 ½ hour meditation. Click here to read the article. Please bring a bottle of water to drink and a shawl or wrap to keep warm. Finally, you are encouraged - but not required - to cover your head, which helps to contain the energy you produce while chanting. If you do not have a head cover, some will be available for purchase for £3. This morning meditation is being offered by donation. Proceeds will offset the direct expenses related to this event and support the Guru Ram Das Project which is a UK based charity set-up with the primary aim of improving the mental, physical and spiritual wellbeing of the community especially by sharing the technology of Kundalini Yoga with people and groups who wouldn't otherwise have access. Any amount is welcome and you can contribute anonymously. There are many musical variations of this mantra. To hear a few of our favorites, you can check out our Mantra for Miracles playlist on Spotify.